AdGuard 3.0 is now available. The new version of the popular content blocker for Android features a redesigned interface, new stealth mode, support for custom lists, and more. The new version of AdGuard is already available on the developer website. Point your Android browser to this URL and hit the download button to download the new version to your system. Note that you do need to allow application installations from unknown sources in the Android settings to install the app. What is AdGuard? AdGuard is a content blocker that runs silently in the background. It blocks advertisement and other undesirable elements in all browsers in the free version. Premium users have ads blocked in all apps that they run on their device. Some features are only available in the Premium version. You may buy a lifetime license or a subscription-based license on the AdGuard website. Tip: Check out our review of AdGuard DNS here. The app launches a wizard on first start that walks you through some essential configuration options. The wizard is well suited for new and inexperienced users who may feel overwhelmed when they access the entire options the app provides. It is naturally possible to manage all options in the Settings at any time. Existing users may notice the redesigned interface right away. Layout, icons, and styles have changed, and it is now possible to switch to a dark theme if that is preferred. Just activate it in Settings > General > Dark Theme to do so. The homepage displays the status of the protection and statistics. The developers have added charts to the app which you may access with a tap on the arrow icon next to any of the numbers on the homepage (e.g. ads blocked). AdGuard 3.0 supports more filter lists by default and custom URL filter lists. Select Settings > Content Blocking > Filters to get started. There you may enable or disable specific preset filters, e.g. the Security or Annoyances list. Custom filter support is reserved for Premium users of the application. You may use it to load filters from URLs that you specify provided that the filter lists are in the correct format. Stealth Mode is another new feature and it is reserved to premium users as well. Basically, what Stealth Mode does is add better privacy protections to the device. Stealth Mode supports a large range of privacy options; you may use it to enable the self-destruction of first-party or third-party cookies, change the TTL of third-party cookies, strip URLs of tracking parameters, disable specific browser APIs, hide your user-agent, mask your IP address, or hide search queries. Some features may appeal to all users, others are probably only of interest to advanced users. The widget has been redesigned and features some stats about blocked requests. AdGuard supports DNS-over-TLS in version 3.0. You can find out more on the official blog. AdGuard is a great application for Android to block ads and other undesirable elements on the device. It works best with a Premium license but does a good job as well when you run the free version. The new 3.0 upgrade introduces much needed functionality, some of it reserved for Premium users. The ability to load custom filter lists is handy, and the new Stealth Mode introduces privacy protections that give users more control over what is happening on their devices. AdGuard is available in sales regularly. New users may want to start with the free version and upgrade to the Premium version in an upcoming sale. Now You: do you use AdGuard or another content blocker on Android? Blokada apk is free source and excellent solution. Try it. I did try Blokada; it’s a 50cc moped. AdGuard is 1000cc superbike. Which is not to say a 50cc moped serves no purpose. AdGuard has DoH and DoT, AdBlock filters support, HTTPS filtering and an application firewall for both WiFi and cellular. With each of those features presenting configuration options to satisfy the most savvy power users. Yet its default install provides the transparency the mainstream user requires. Forgot to address “free source.” No argument there, free is Good. But AdGuard is $10 a year or $25 lifetime. If you can’t afford that, how is it you can afford a smart phone? @Haakon Or you can simply root your phone and use AdAway which doesn’t even run in the background. Even cheaper if you search for AdGuard on “Deals” in this website, and even cheaper cheaper when you incorporate with other promotions. It’s really dirt cheap imo. I now own 6 mobile licenses, 6 desktop license and use them on various devices of mine and family members’. Totally worth it. Compare the battery life you get with the “moped” and the “superbike” – with the same fuel tank. If you have a good adblocking browser, Blokada actually does pretty much everything else, also Blokada isn’t related to Russia (even though they’re in Cyprus now so I’d trust them a bit more). This app is great. Ive recommended it to friends and they are very happy with the easy setup. It basically gets the most out of an android phone, privacy and security wise. Nothing else needed in that regard. I also use their chrome extension, as they are the only one who offer so much privacy options with their stealth mode. which is lacking from other extensions. Forgot to say adguard browser extension also has the “I don’t care about cookies” list that is missing in uBO. Is it important to install antivirus like Bitdefender, Karkersky, malwarebyte ? Impact on battery with app that runs in background like Adguard ? Does it block ads in Youtube? The desktop version definitely does. I am using a PC without it currently and YT viewing is terrible with so many ads during videos. Been using AdGuard for Android for about five years, on four different devices, currently a Moto X4 (Pie) and a Samsung Tab A 10.1 (Oreo). I’ve got all the protection and privacy settings tweaked to the max without any ill effect on the devices’ operation. The level to which AdGuard has refined this app is impressive. DoH is icing on the cake. For about six months I’ve been using SecureDNS, see securedns dot eu. Pie Private DNS users not running AdGuard should check it out if they’re having issues with other providers. Last year I decided to stop the annual renewals and go lifetime. I can’t imagine using Google’s Android without it. Or on my Windows PCs, the extension in Firefox as I have not yet warmed up to their full-blown Windows product. Because of the interaction between apps ? Because it’s more fast to access with apps ? What’s the pros and cons ? You can add lists to uBlockOrigin. Not as such. I run a VPN from my home server, and my Android devices only get to communicate through that VPN. This allows me to not only ensure that my communications are encrypted, but more importantly lets me use all of the protections I use for my home LAN. I also run a firewall on my Android devices (which is in addition to the firewall in my home) and I keep a rather length list of blocked domains in my hosts file on my Android devices. I just visited the Android section of the Adguard site at adguard dot com, and the info there does not at all correspond with the info given here. 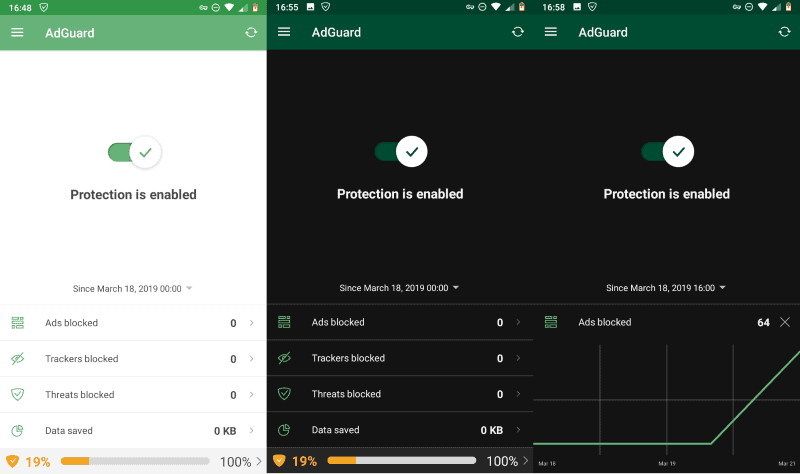 There is no mention of a free version of Adguard for Android, the only “free” download seems to be a 7-day trial version. There is no mention of a premium version either, so it looks like there is only one version, which is free for this 7-day trial period only. The site does show three purchase options, each on either subscription- or lifetime basis. There is a standard license for PC/Mac, a mobile license for Android, and a premium option which covers a standard and a mobile device in one single license. The exact prices of all licenses vary by the exact number of devices you want to use Adguard on. Bottom line: Adguard on one single Android phone is not available for free, but will cost you € 0.75 per month plus VAT. sorry, it was a bit rude. So where exactly is that supposedly free version located on the Adguard site? Maybe my eyes are failing me (I won’t rule that out) but I really don’t find a download option for any free version there. The only download the Adguard site offers for an Android APK file states very clearly that this is a trial version, quote: “AdGuard for Android version 3.0, 7 days trial period”. Moreover, nowhere on the Adguard site I found any comparison between a “standard” versus a “premium” Android version, nor did I find any mention at all of a free vs. a paid option. If I am somehow mistaken, then please could you point me to the free version? Thanks! Just download the version offered on the developer website. The wording is a bit problematic, you can test Premium for 7-days if you want but don’t have to, and if you don’t, you run the free version. The Android page states that there is a free version if you scroll down to the FAQ section. Tried the free version a year or so ago and it didn’t block in app ads, most other ads can be zapped by keeping play off and not using chrome. I believe the paid version does block in app ads. The windows version was updated to ver. 3 recently, too and seems to work more smoothly, especially the element blocker tool. The interface is far different and a little confusing at first but no biggie to get used to it. All our win machines have adguard on them; it works well and the interface isn’t cryptic as some are. I have 2 PC and 3 mobile lifetime licenses for this software and I rarely do buy them. After ad-munch folded and stopped being effective, I found this gem but waited for promos to get it!